This week was a pretty hectic one, with a bunch of central bank rate decisions and the highly-anticipated US non-farm payrolls report. Just like the American Idol hopefuls, most majors bounced back from their dismal performance last week and attempted to finish stronger this week – some succeeded, others didn’t. Price action stalled mid-week as the movement then shifted in favor of the safe-haven currencies. Aside from Greece’s debt problems, the usual culprit in setting risk aversion loose, bleak labor figures from the US crushed hopes for an upbeat NFP figure. It turns out these blasted snowstorms did more than just damage my new suede boots! Before I go, I have to confess something… On my last EURUSD short trade, I closed one of my positions early when the price missed my PT by a pip. I was just browsing through the charts during my lunch break and I noticed that the price bounced off 1.3551 and proceeded to move higher. 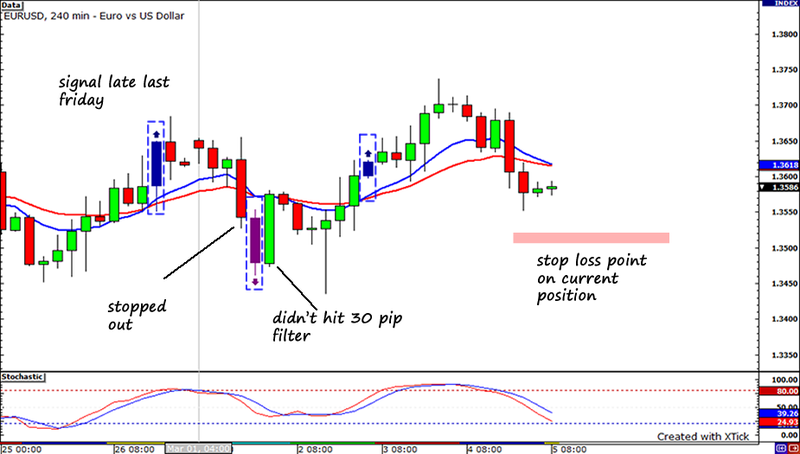 This happened in my second position for my previous EURUSD trade and I wasn’t able to lock in those pips then. This time, I decided to deviate from my trade plan a bit and manually close half at 1.3560 because, well, I got scared. As for my HLHB system, it had three crossovers this week. One was a loser, the other was invalid and the third one… well, I’m still in it. The first crossover happened early on Friday, when the 10 EMA crossed under the 20 EMA. Stochastics still wasn’t in overbought territory, allowing me to go long once price goes 30-pip above the high of the crossover candle. Unfortunately, I was forced to exit my position once price made a bearish crossover soon after. I wasn’t able to jump short on that one though as price didn’t quite meet my 30-pip filter. So now, the HLHB system is currently in a long trade that was triggered at 1.3653 yesterday. The stop is set at 1.3513. If you find this all confusing, just check out the my first post about the HLHB system here!